Not much going on with our London trip today. I spent the morning wrapping up a huge clock, that I bough here in London over Christmas, that I’m bringing back with me to Norway this trip. I’ll tell you all about it when I get home. Today though, I’ve handed over a couple of my dad’s things to my brother. Items I’ve been holding for him at my house in Norway. 1 wooden box, not sure where my dad got it, if it was from his travels or if it’s from grandfathers. 1 keg, made by our great grandfather or grandfather (not sure which). 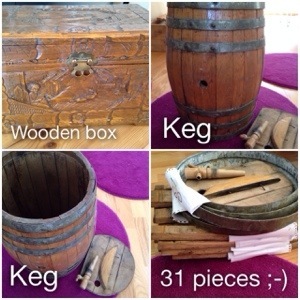 The only way I could get the keg with me, was to break it down to its individual pieces. That keg is beautiful. We had a barrel like that once that we used as an end table. Oh, my. Not sure I’d have dared! Necessity is the mother of invention, however!